1. Vacuum first if you haven’t done so recently. Seriously. Even if you don’t have cats, like we do. It’s not the end of the world if you don’t, but you should be warned that hair does gravitate toward the puffs. 2. A D-handle on the rake, so you don’t have to be quite as nervous about someone losing an eye while doing this. The puff balls alone are a fun texture toy. I got the puff balls at my local craft store. The bag had mixed colors and sizes (from about 1/2 inch to roughly 2 inches) and I got them because they’d be a fun alternative texture to the beans and rice we’d been playing with. They are good for mixing with the beans because they are easy to pick out, but while they’re in there, they make for a great disparity of textures. I also figured that if my daughter wasn’t interested in playing with the puffs, we’d keep them for crafts. It turns out she does love them – so much so that I can’t put them away. Ever. More up-sides to the puffs: They are light and easy for a little kid to carry around in a bowl; they were fairly cheap (use store coupon = even cheaper! ); they are fun to sort in different ways; they make great cat toys after your child’s gone to bed; they are completely replaceable, in the event of loss; they are quiet, for when mama has a headache; if you put them in a bowl, they make a great ball pit for Fisher Price Little People; and so on. Now for the rake. I found it at my local super-discount/grocery store for $1.79. My mind has been turned outdoors and toward autumn, when my yard fills with leaves to be raked up. What does one do with a toddler when one has yard work to do? Put her to work. It’s about time she started earning her keep. When I got home, the tot saw the rake and demanded to use it. As it happened, there were puff balls scattered across my living room. Ding! Conveniently, the brightness from the light bulb over my head provided good lighting for her to play by. 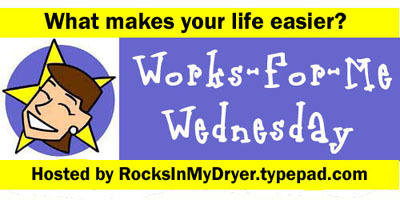 Hop on over to Rocks in my Dryer for about a billion more great ideas!